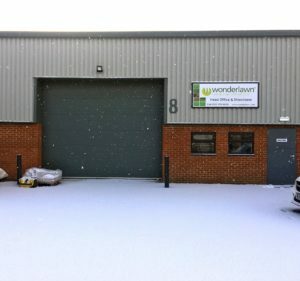 At Wonderlawn, our nationwide teams of installers work all year round, in all weathers, to allow a quick turn around from the moment you purchase your lawn installation, to the moment work has begun. It’s a fact: artificial grass can be installed all year round. But many people choose to have it installed in the summer months. Artificial grass is usually best installed in the autumn and winter months for a few reasons. The garden isn’t as hard as in the summer. The “dig-out” can be easier if the soil is wet. Waterlogged gardens can have their drainage improved with a Wonderlawn installation. Once your installation is complete, you can use your garden again in the winter. Because artificial lawns are made from plastic polymers, it means they are weather resistant and can be used any time of year, without the risk of damage or excessive mud, and with a quick drying time following rain. Wintry weather such as snow and frost don’t usually cause problems with an artificial lawn, but care should be taken if ice has formed. This will naturally melt once the winter sun meets your artificial lawn. Can artificial grass be installed in winter? You’ll be happy to know, artificial grass can be installed all year round, no matter the weather. Obviously, in some extreme weather cases, it can be hazardous to install on certain sites, but at Wonderlawn we’ll always do our upmost to install your Wonderlawn on the agreed time. UV stabilised meeting DIN 53387 standard. Free of Lead and Cadmium. The best temperature to install artificial grass is between 5°C and 19°C degrees Celsius. If the temperature is below this, then our installation team will usually roll the lawn out in the morning and allow the grass to soak up some of the winter sun for a while. In the afternoon, when the grass has had some time to acclimatise, they can install your lawn as normal. If you’re unsure of the artificial grass installation process or prefer to stay indoors while the Wonderlawn experts turn your old lawn into a garden paradise please contact us. All our installers across the UK are professionally trained and work throughout the year. Once your artificial grass has been installed you can follow our artificial lawn care tips. Artificial lawns covered in snow or frost? We recomend leaving it to melt naturally, not using a metal spade, chemicals or salt to melt it. If you urgently need to remove snow or ice from your lawn, carefully use a plastic shovel, that won’t damage the individual blades of your lawn. Do not be tempted to use hot items on your lawn. Lighting a fire, using a barbecue or chimaera should only be setup away from your lawn to avoid damage and scorch marks. If you are placing heavy items on your lawn, especially in Winter, make sure you brush the fibres upright again once the heavy item is removed. Enjoy the cold winter months without worrying about muddy puddles, icy patches, or the constant up keep of maintaining a traditional lawn.